Airbus was founded on 18 December 1970 and delivered its first aircraft, an A300B2, to Air France on 10 May 1974. This was the world’s first twin-engine, wide body (two aisles) commercial airliner, beating Boeing’s 767, which was not introduced into commercial service until September 1982. The A300 was followed in the early 1980s by a shorter derivative, the A310, and then, later that decade, by the single-aisle A320. The A320 competed directly with the single-aisle Boeing 737 and developed into a very successful family of single-aisle commercial airliners: A318, A319, A320 and A321. 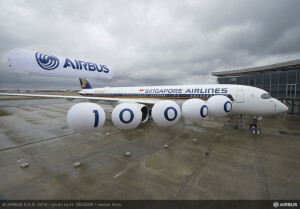 On 14 October 2016, Airbus announced the delivery of its 10,000th aircraft, which was an A350-900 destined for service with Singapore Airlines. As noted previously, Airbus beat Boeing to the market for twinjet, wide-body commercial airliners, which are the dominant airliner type on international and high-density routes today. Airbus also was an early adopter of fly-by-wire flight controls and a “glass cockpit”, which they first introduced in the A320 family. In October 2007, the ultra-large A380 entered service, taking the honors from the venerable Boeing 747 as the largest commercial airliner. Rather than compete head-to-head with the A380, Boeing opted for stretching its 777 and developing a smaller, more advanced and more efficient, all-composite new airliner, the 787, which was introduced in airline service 2011. Airbus countered with the A350 XWB in 2013. This is the first Airbus with fuselage and wing structures made primarily of carbon fiber composite material, similar to the Boeing 787. 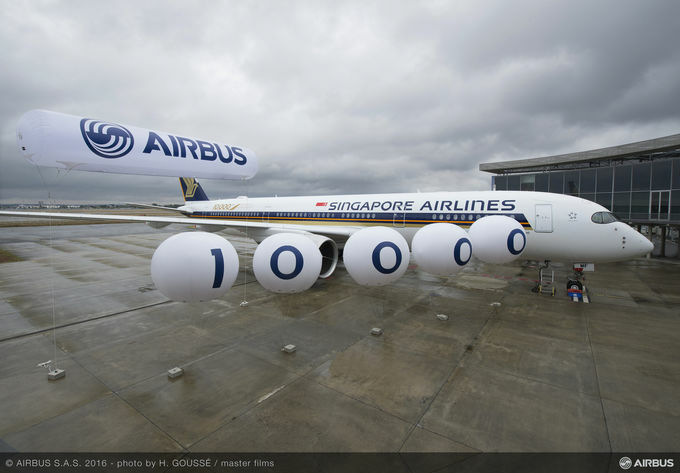 The current Airbus product line comprises a total of 16 models in four aircraft families: A320 (single aisle), A330 (two aisle wide body), A350 XWB (two aisle wide body) and A380 (twin deck, two aisle wide body). 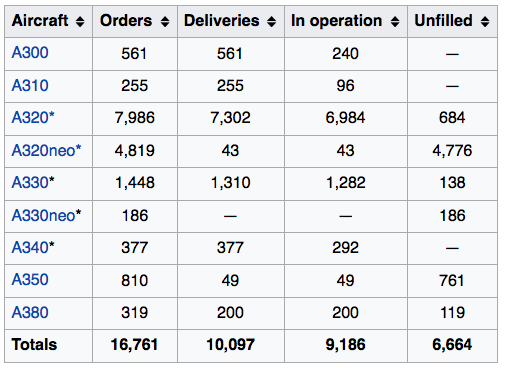 The following table summarizes Airbus commercial jet orders, deliveries and operational status as of 30 November 2016. Boeing is the primary competitor to Airbus. Boeing’s first commercial jet airliner, the 707, began commercial service Pan American World Airways on 26 October 1958. 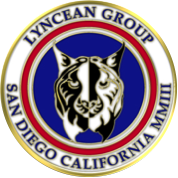 The current Boeing product line comprises five airplane families: 737 (single-aisle), 747 (twin deck, two aisle wide body), 767 (wide body, freighter only), 777 (two aisle wide body) and 787 (two aisle wide body). 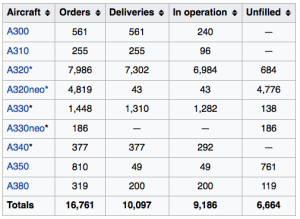 The following table summarizes Boeing’s commercial jet orders, deliveries and operational status as of 30 June 2016. 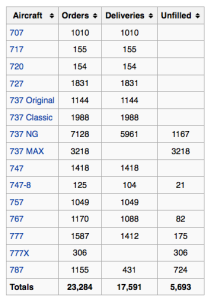 In that table, note that the Boeing 717 started life in 1965 as the Douglas DC-9, which in 1980 became the McDonnell-Douglas MD-80 (series) / MD-90 (series) before Boeing acquired McDonnell-Douglas in 1997. Then the latest version, the MD-95, became the Boeing 717. Boeing’s official sales projections for 2016 are for 740 – 745 aircraft. Industry reports suggest a lower sales total is more likely because of weak worldwide sales of wide body aircraft. 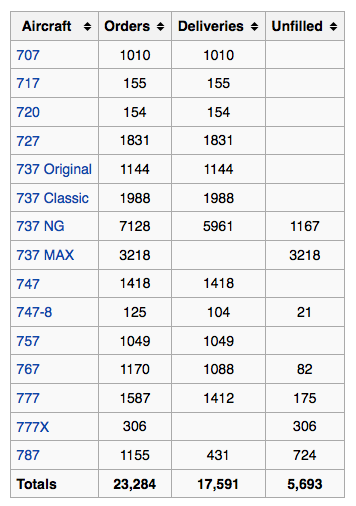 Not including the earliest Boeing models (707, 720, 727) or the Douglas DC-9 derived 717, here’s how the modern competition stacks up between Airbus and Boeing. These simple metrics show how close the competition is between Airbus and Boeing. It will be interesting to see how these large airframe manufacturers fare in the next decade as they face more international competition, primarily at the lower end of their product range: the single-aisle twinjets. Former regional jet manufacturers Bombardier (Canada) and Embraer (Brazil) are now offering larger aircraft that can compete effectively in some markets. For example, the new Bombardier C Series is optimized for the 100 – 150 market segment. The Embraer E170/175/190/195 families offer capacities from 70 to 124 seats, and range up to 3,943 km (2,450 miles). Other new manufacturers soon will be entering this market segment, including Russia’s Sukhoi Superjet 100 with about 108 seats, the Chinese Comac C919 with up to 168 seats, and Japan’s Mitsubishi Regional Jet with 70 – 80 seats. At the upper end of the market, demand for four jet heavy aircraft is dwindling. Boeing is reducing the production rate of its 747-8, and some airlines are planning to not renew their leases on A380s currently in operation. It will be interesting to watch how Airbus and Boeing respond to this increasing competition and to increasing pressure for controlling aircraft engine emissions after the Paris Agreement became effective in November 2016.